Which is the best smart speaker for you? The Amazon Echo or the Sonos One? The number of smart speakers on the market just keeps on rising: good news for consumers in terms of choice of course, but it does mean the process of picking one for your home is taking longer and longer as more models get added to the list of options. 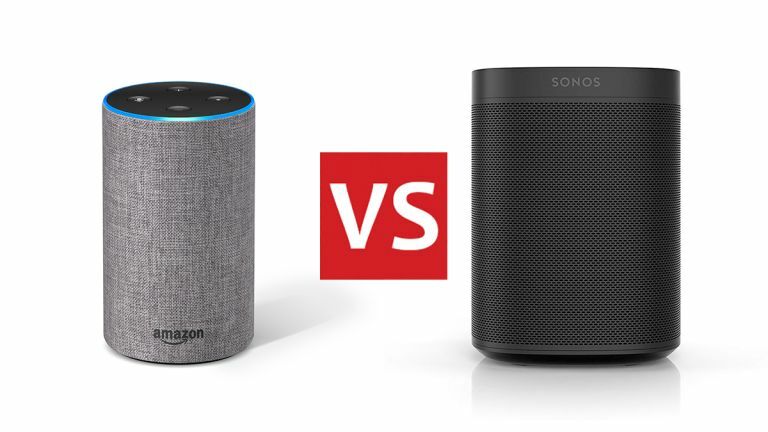 We're here to help make your purchasing decision that little bit easier by comparing two of the best smart speakers you can get in 2019, the second-generation Amazon Echo and the Sonos One. Which of these excellent devices is most deserving of your hard-earned cash? How does the Sonos One stack up against the Apple HomePod? Top marks to the engineers at both Amazon and Sonos because these are two very nice-looking devices indeed. At 148 mm x 88 mm (5.83 inches x 3.46 inches), the Amazon Echo is the more compact of the pair – the Sonos One comes in at 161.45 mm x 119.7 mm (6.36 inches x 119.7 inches). The Echo is available in more colours too, offering charcoal, grey, sandstone, oak, walnut and silver, compared to the Sonos One's white or black. While the Amazon Echo might just have the edge in terms of aesthetics and its choice of designs, the Sonos One beats it in the audio quality stakes – its Class-D digital amplifiers, tweeter and mid-woofer offer a depth and richness the Amazon Echo can't quite match. The Echo is perfectly fine for audio, but the Sonos One wins out here. As with every other Sonos speaker, the Sonos One also works with a wide range of music services – just about every music service out there in fact, with apps available for mobile and desktop platforms. It also supports AirPlay 2. The Amazon Echo supports the Amazon, Spotify and Apple music services, though as it supports Bluetooth as well (something the Sonos One doesn't), you can beam music over from an app that way too. We've already spoken about the size of these speakers and the supported services, but there are other specs and features worth a mention. The Amazon Echo has a 3.5mm output jack for example, for connecting almost any other speaker up to the Echo for some audio oomph. The Sonos One doesn't have this feature, but it does have an Ethernet port if you want to connect it directly to your router and ensure a super-fast, super-stable connection to your internet. Besides the digital assistants on board these speakers, the main differences are the way in which you can play music – as we've said, Sonos makes a comprehensive app for phones and computers that lets you queue up music from almost any service, as well as iTunes. The Amazon Echo doesn't have this, though as we've mentioned the Bluetooth option is a perfectly adequate backup option. Both speakers let you set up two of them and use them as a stereo pair for listening to music. The Amazon Echo is a smart speaker first and foremost, whereas the Sonos One is a wireless music speaker first and foremost. Both can handle audio across multiple rooms in your home, but Sonos does it in a way that's a little more intuitive. The Sonos One is also compatible with the Spotify Connect standard, which means any Spotify app for mobile or desktop can beam audio straight to the speaker. The quality of the digital assistant is of course an important consideration for any smart speaker purchase, and there's no doubting the quality of Alexa on board the Amazon Echo: its capabilities just keep growing and growing, so whether you want to order a pizza or find out when your team's next football match is, Alexa can help. And Amazon Alexa is built right into the Sonos One as well – so you can do all of the cool voice command tricks available on the Amazon Echo on the Sonos One too. From getting Alexa to start playing music, to finding out what the weather forecast for the day is going to be, the Sonos One can handle it once you've configured the device through the Alexa app on your phone. What's more, Google Assistant support is coming soon as well. With Alexa on board both the Amazon Echo and the Sonos One, you can use these speakers to control other smart home devices using only your voice. You can even start playing music on different Sonos or Echo speakers throughout the home, as long as they're all connected to Alexa. So both speakers have Amazon Alexa on board, but the Sonos One has a richer audio output and is more versatile in terms of the music it can play – that being the case, why would you ever buy the Echo? Well, the prices: at the time of writing, a Sonos One is more than double the price of an Amazon Echo (check the widgets on this page for the very latest deals available on the web). The Amazon Echo does have the option of Bluetooth, which the Sonos One doesn't have, and which can come in handy when you're travelling out of Wi-Fi range. It also looks slightly nicer and is available in a wider choice of finishes – something to consider if you're looking for a smart speaker that's going to ease effortlessly into whatever design aesthetic you've got in place at home. Ultimately though it's a decision about how much you're willing to pay for a superior audio and music experience. If music quality matters most to you, the Sonos One seems like a good choice. If you just want a smart speaker first and foremost, which doubles up as a decent wireless music player as well, then the Amazon Echo might be a better bet. Amazon Echo vs Google Home: which is the ultimate smart speaker?